Section 1: Any person who is interested in participating in the hobby of RC Airplanes and Helicopters is eligible for membership. Section 2: Any member claiming reasonable justification may resign from this club by giving notice to the club president. Section 1: The application of any person interested in becoming a member of this club, shall be sponsored by a club member in good standing. The membership application will identify the applicant by name, age, resident address, profession or occupation and will include the current AMA number of the applicant. An initiation fee and dues required by the By-Laws also must accompany the membership application before it will be considered. Section 2: Any applicant who meets the foregoing requirements and who receives a vote of approval by a majority of members attending a regular meeting will be eligible for membership. Section III, Fees and Dues..
member may be reinstated by making payment of those dues in arrears and a reinstatement fee as may be required by the By-Laws. Section 3: Should any special assessments be in order for the promotion of club activity or extension of its properties, said assessments shall be subject to investigation by committee, and must pass by a two-thirds vote of active members in good standing. Section 1: The elective officers of this club shall consist of a President, Vice- President, Secretary/Treasurer, and at least one Field Marshall, (Safety Officer) who shall serve a term of one year. The elected officers, as a whole, shall be referred to as the Executive Board. Section 2: Nominations for elective officers shall be made only during the two meetings preceding the election. Section 3: Officers shall be elected during the last regular meeting of November, if more than one meeting is conducted monthly, and the officers will be installed and will begin their duties January 1. Section 4: Any elective officer absenting himself from the club for three consecutive regular meeting may be removed from office, after a resolution for that purpose shall have been offered one week before action is taken. Section 5: The duties of the various officers shall be laid down as specified in this constitution and By-Laws of the Club. Section 6: The President, or officer acting as such, shall appoint the majority, and the Vice-President, or officer acting as such, shall appoint the minority of all committees. Section 7: The President will present to the membership for approval recommendations for members of the Board of Directors. The members of the Board of Directors shall hold their offices for a term of one year. The current President shall be one member of the Board. Section 1: Any member refusing or neglecting to make payment of his/her dues to the club, according to its By-Laws for more than three months, shall not be entitled to vote or speak on any question brought before the club, but shall be deemed a contributing member until suspended, dropped or expelled, and as such shall be entitled to visit his/her club, and when any member becomes in arrears for the period of two months, the Secretary having charge of such accounts shall report to the President at a regular meeting, and at the next regular meeting thereafter, unless the club otherwise directs, such member shall thereupon be suspended: provided that before any member can be suspended or dropped for non-payment of dues, notice of such contemplated action shall be given him by the Secretary; provided further that the delinquent member may pay his/her dues in full at any time prior to such action. Section 2: Any members who may have been suspended or dropped for non- payment of dues may be reinstated upon the payment of the fee charged for an initiate of the same age or such sum as the By-Laws prescribe. Section 1: The funds and property of this club having been raised for the benefit of the club as a whole, cannot be divided in any way among the members individually, or between this club or any other club, but shall remain the property of this club, for its legitimate uses. Section 1: This club may make, alter or rescind such By-Laws, Rules and Regulation, from time to time, as may be considered necessary, provided they do not in any way contradict this Constitution. Section 2: the By-Laws of this club are in force from the time of their approval by two-thirds vote of the members in good standing at a regular club meeting. ARTICLE I MEETINGS Section 1: The regular meetings of this club shall be held at times and a place agreed upon by members. Section 2: A special meeting may be called by the President, either at his direction or at the request of five members in good standing. No business shall be transacted at special meetings other than that for which the meeting was called. Special meetings which determine penalties such as those described in Article II Section 1 and 2 or any section of Article VI shall have at least three elected officers present, including the President, who must be present. Section 3: At all meetings, the presence of 10% of the membership shall constitute quorum for the transaction of business. If a quorum is not available at three consecutive meetings, such items that would normally be decided only by a quorum can be decided by a majority vote of members present at a regular club meeting. Section 4: The club meeting shall be opened by the President or, in his absence, the Vice-President. Should both the President and Vice-President be absent, the meeting may be opened by a past president with seniority being considered. Should no such person be present, all club business shall be postponed until the next regularly scheduled meeting. Section 1: All applications for membership must be accompanied by the recommendation of a club member in good standing and must meet other requirements as provided in Article II, Section 1 of the Constitution. The initiation fee and dues required by the By-Laws must accompany the application. The elected Treasurer may make occasional exceptions and allow partial payments toward club dues and fees for a period of up to three months. If the applicant defaults in payment, the Treasurer may recommend to the Executive Board that action be taken against the applicant, up to and including expulsion from the club and/or collection of money owed. Section 2: Should the applicant be rejected, the admission fee shall be returned to him, but if elected and he fails to appear at 3 succeeding regular meetings thereafter, such election will be void and the amount paid forfeited to the club, unless a reasonable excuse be given. Section 1: The initiation fee for persons under age 19 who are admitted to the club, shall be $5.00. The initiation fee for families and for persons 19 years of age or older, shall be $25.00. A once-in-their lifetime “Field Improvement Fee” of $75.00 shall be paid by each new member 19 years of age or older. Section 2: Members reinstated shall pay the same amount as a new applicant of the same age as provided in Article VI, Section 2 of the Constitution and Article III, Sections 4 & 5 of the By-Laws. family membership, shall pay 1/12 of the appropriate dues for each month remaining in the year, during which they become members. In no case shall dues be assessed that would exceed the appropriate annual dues. Section 4: All members are required to be current AMA members before membership is in effect. 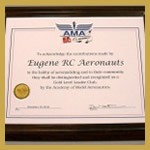 All members must maintain a current AMA membership at all times or lose active status and all flying privileges. No exceptions will be made. 1: Club dues are payable at or prior to the first meeting of the new year. 2: Before dues are accepted, the club member must show evidence of current AMA membership for the year in which the club dues relate. 3: Members still delinquent by the February meeting will be advised by mail or email that dues must be paid, along with a $10.00 late fee, by the March meeting. If this does not take place by the March meeting they will be dropped from the club membership and will not be permitted to use any designated club flying area. 4. Dropped members that rejoin the club after the March meeting shall pay the initiation fee of ($5.00 or $25.00) but not the lifetime “Field Improvement Fee”. They shall pay the appropriate annual dues (no dues for members 18 or under) for that year. If a dropped member rejoins after the dropped year they will be treated as a returning member. 5. Returning members pay only the ($5 or $25) initiation fee but not the lifetime “Field Improvement Fee”. They shall also pay the yearly dues as provided by Article III of the By-Laws. Section 1: No member who is in arrears, in accordance with the period stated in Article VI Section 1 of the Constitution, shall be allowed to vote on any question before the club. Section 2: If any member, who shall willfully make false or malicious charges or accusations against another member, in or out of the club, shall be subject to suspension or expulsion, according to the extent of the offense. Section 3: If any member shall disregard the authority of the President by persisting in the use of improper language or conduct himself in a disorderly manner, the club may inflict such penalty as the case may require, which may result in expulsion. Section 4: Any member guilty of improper conduct within the club, or who shall knowingly propose an unworthy person for membership shall be subject to suspension or expulsion, as the club may determine. Section 5: Any member guilty of an infamous act against the laws of the land shall be expelled. Section 6: Any member guilty of flying a model aircraft at the ERCA flying site without current AMA coverage will face a suspension of up to six months for a first offense. Any member guilty of such conduct a second time will be suspended for up to 12 months and face possible expulsion from the club. Section 7: Any incident in which a non-member is found to be flying a model aircraft without current AMA coverage at the ERCA flying site may be trespassed from ERCA property and events. Section 8: Any action taken against a member or non-member of the club when decided and voted on by the Executive Board at a special meeting to be arranged by the President. The Executive Board may exercise discretion when assigning penalties. Section 9: Any member who allows their AMA membership to lapse will be considered in arrears of Article III Section 4 of these By-Laws and will not be permitted to vote on any question before the club. Section 1: The elective officers shall be voted for separately and must receive a majority of all votes cast to entitle them to election. When there are more than two candidates for the same office the candidate having the least number of votes shall be dropped at each successive ballot. Section 2: At all elections for officers and directors, the Secretary shall provide blank ballots for the use of the members. The President shall appoint two members who shall count the votes cast and declare the results to the president, by whom it shall be announced to the club. Section 3: Membership shall he notified, by mail or email prior to club elections, allowing them a absentee ballot if unable to make scheduled meetings. Section 1: It shall be the duty of the President to preside at all meetings and enforce the due observance of the Constitution and By-Laws, see that the officers of the club and members of committees perform their respective duties, have charge of the door, give the casting vote on all matters and questions (except at elections for officers and applications for membership), have charge of the Charter, know and sign, if necessary, all warrants drawn by the Secretary or the Treasurer, for sums as shall have been voted upon by the club, and perform such other duties as pertains to his office. Section 2: The Vice-President shall assist the President in the performance of his duties, appoint the minority in all committees, preside in the absence of the president, and perform all other duties required of him. The Vice-President shall act as the Director of contest activities approved by club members. Section 3: The Secretary shall keep and correct records of all proceedings of the club, write and issue all communications and notices ordered by the club, notify members in arrears, as provided in Article IV Section 1 of the Constitution and perform such other duties that may be required of him. Section 4: The Treasurer shall receive from the Secretary all moneys of the club, giving a receipt for the same, pay all orders drawn on him by the Secretary and signed or noted by the President, have book in which he shall keep a full account of all money received and dispersed. He shall after the last meeting of his term, furnish the club with a full report of all receipts and disbursements of the term. Section 1: The board of directors shall consist of five members, one of whom shall be the President. Section 2: It shall be the duty of the Directors to perform such functions as required by the club concerning any major issue that may affect the club as a whole They shall receive, from the Treasurer, such sums of money needed to expedite the clubs activities, act as a body in fulfilling the needs of the club, their findings and decisions to be voted upon by the members, acquire, in the performance of their duties (under the supervision of the club), and perform all other duties, pertaining to them, in accordance with the desires of the club. Section 1: At the beginning of each term, the President and Vice-President may appoint a Finance Committee to consist of three members, whose duty it shall be to examine all accounts brought before the club and initial also to inspect and audit the accounts of the Secretary arid Treasurer and all other officers or committees who may be charged with the receipt and disbursement of the club funds. Section 2: At any time, the President and Vice President may appoint a committee to research, review, or enact a project or proposal made by the majority at a regular meeting. This committee will be dissolved once its purpose has been served in its entirety or the project or proposal has been rescinded or terminated. Section 1: Current expenses of the club may be paid at any regular meeting by a vote of the club. Section 2: No funds of this club shall be loaned to any member or to any person or persons outside the club. Section 3: No expenditure exceeding $300.00 can be made without a majority vote at a regular club meeting. Section 4: Any expenditure exceeding $1,500.00 may not be paid, without a majority vote at two consecutive regular club meetings. Section 5: An emergency expenditure, not to exceed $1,500.00, may be made by a unanimous vote of all Executive Board members. Notification of the expenditure shall be mailed or emailed to all club members immediately. Section 1: No part of these By-Laws shall be repealed, altered, annulled or amended, unless a proposition, in writing, be made at two regular meetings prior to the time of its being acted upon. If two-thirds of the members present vote in favor of such proposed amendment, it shall be adopted. Section 2: All former By-Laws are hereby repealed as of June 25, 2013.